through of the core at unit 2. I had not previously seen references to this in the general press. Workers at the crippled Fukushima Daiichi nuclear plant appeared to have “lost the race” to save one of the reactors, a U.S. expert told the Guardian. 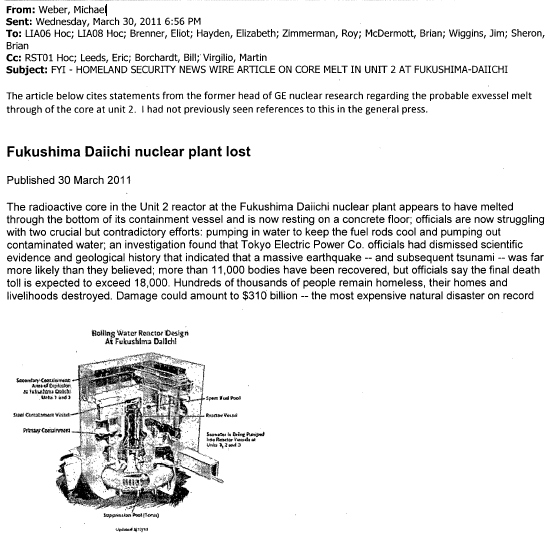 Richard Lahey, who was head of safety research for boiling water reactors at General Electric when the company installed the units at the Japan plant, says the radioactive core in the Unit 2 reactor appears to have melted through the bottom of its containment vessel and on a concrete floor. 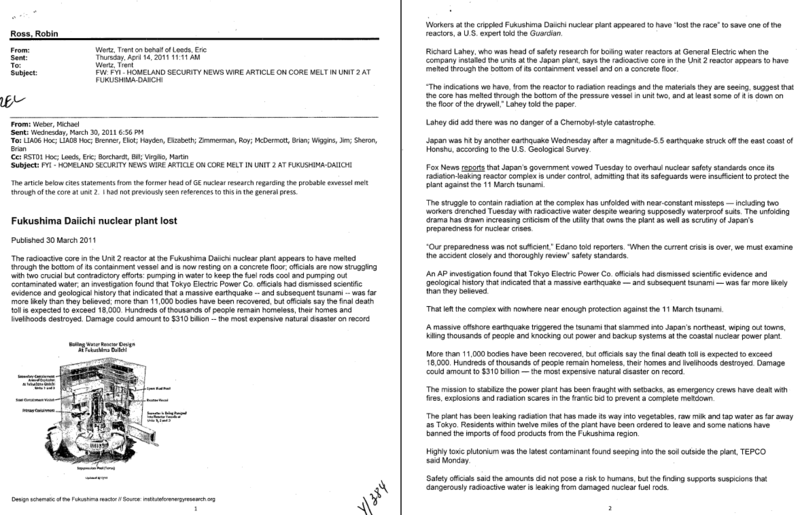 “The indications we have, from the reactor to radiation readings and the materials they are seeing, suggest that the core has melted through the bottom of the pressure vessel in unit two, and at least some of it is down on the floor of the drywell,” Lahey told the paper. Lahey did add there was no danger of a Chernobyl-style catastrophe. Japan was hit by another earthquake Wednesday after a magnitude-5.5 earthquake struck off the east coast of Honshu, according to the U.S. Geological Survey. Fox News reports that Japan’s government vowed Tuesday to overhaul nuclear safety standards once its radiation-leaking reactor complex is under control, admitting that its safeguards were insufficient to protect the plant against the 11 March tsunami. The struggle to contain radiation at the complex has unfolded with near-constant missteps – including two workers drenched Tuesday with radioactive water despite wearing supposedly waterproof suits. The unfolding drama has drawn increasing criticism of the utility that owns the plant as well as scrutiny of Japan’s preparedness for nuclear crises. “Our preparedness was not sufficient,” Edano told reporters. “When the current crisis is over, we must examine the accident closely and thoroughly review” safety standards. An AP investigation found that Tokyo Electric Power Co. officials had dismissed scientific evidence and geological history that indicated that a massive earthquake – and subsequent tsunami – was far more likely than they believed. That left the complex with nowhere near enough protection against the 11 March tsunami. A massive offshore earthquake triggered the tsunami that slammed into Japan’s northeast, wiping out towns, killing thousands of people and knocking out power and backup systems at the coastal nuclear power plant. More than 11,000 bodies have been recovered, but officials say the final death toll is expected to exceed 18,000. Hundreds of thousands of people remain homeless, their homes and livelihoods destroyed. Damage could amount to $310 billion – the most expensive natural disaster on record. The mission to stabilize the power plant has been fraught with setbacks, as emergency crews have dealt with fires, explosions and radiation scares in the frantic bid to prevent a complete meltdown. The plant has been leaking radiation that has made its way into vegetables, raw milk and tap water as far away as Tokyo. Residents within twelve miles of the plant have been ordered to leave and some nations have banned the imports of food products from the Fukushima region. Highly toxic plutonium was the latest contaminant found seeping into the soil outside the plant, TEPCO said Monday. Safety officials said the amounts did not pose a risk to humans, but the finding supports suspicions that dangerously radioactive water is leaking from damaged nuclear fuel rods. “The situation is very grave,” Edano told reporters Tuesday. Fox News reports that workers succeeded last week in reconnecting some parts of the plant to the power grid. As they pumped in water to cool the reactors and nuclear fuel, however, they discovered numerous pools of radioactive water, including in the basements of several buildings and in trenches outside of them. 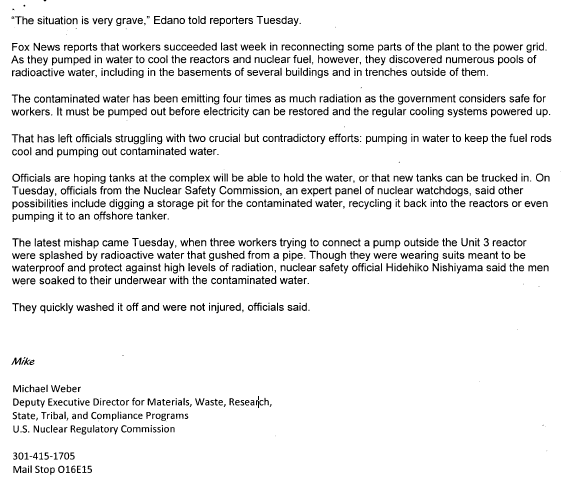 The contaminated water has been emitting four times as much radiation as the government considers safe for workers. It must be pumped out before electricity can be restored and the regular cooling systems powered up. That has left officials struggling with two crucial but contradictory efforts: pumping in water to keep the fuel rods cool and pumping out contaminated water. Officials are hoping tanks at the complex will be able to hold the water, or that new tanks can be trucked in. On Tuesday, officials from the Nuclear Safety Commission, an expert panel of nuclear watchdogs, said other possibilities include digging a storage pit for the contaminated water, recycling it back into the reactors or even pumping it to an offshore tanker. The latest mishap came Tuesday, when three workers trying to connect a pump outside the Unit 3 reactor were splashed by radioactive water that gushed from a pipe. Though they were wearing suits meant to be waterproof and protect against high levels of radiation, nuclear safety official Hidehiko Nishiyama said the men were soaked to their underwear with the contaminated water. They quickly washed it off and were not injured, officials said. TEPCO Compensation Claims Under Further Scrutiny – The document says that residents must renounce their right to file objections after they have received payments.